A horizontal unit is by definition half the width of a quarternote note head. 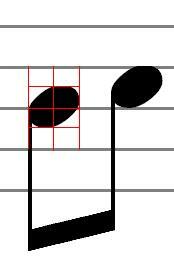 The width of a note-head of a quarternote is thus two horizontal units. Whenever you make an offset to a horizontal position of an object it is measured in horizontal units.